The Manned Orbiting Laboratory was born the same day the DynaSoar project was cancelled, 10 December 1963. Like DynaSoar, the MOL was a US Air Force project. Code named Dorian and designated as KH-10, the MOL was intended to be a military space station and used for reconnaissance. The hardware used was to be a modified Gemini, the Gemini B, and the Titan IIIC. Douglas Aircraft Company was selected as the contractor. The two man crew could spend up to 40 days in a sun synchronous or polar orbit. Launches could be from either Cape Canaveral, FL, or from Vandenberg AFB, CA. The Gemini B capsule had a door installed in the heat shield to provide access to the laboratory. 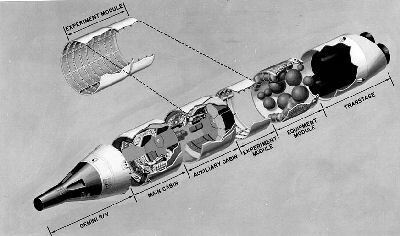 The only MOL flight was a 33 minute suborbital mockup flight reusing the Gemini 2 capsule to test the integrity of the hatch installed in the heat shield. The test occurred on 3 November 1966 from Cape Canaveral and was successful. One Gemini-B was completed but never flown. It is on display at National Museum of the United States Air Force, Wright-Patterson Air Force Base, Dayton, Ohio. After a series of cost overruns and budget cuts, the MOL program was cancelled in June 1969. Seven of the remaining 14 astronauts in the MOL program (there had been 17) transferred to NASA after the cancellation. Page last modified: 16 August 2015 14:51:56.